I returned from teaching a fantastic workshop at Sitka on the Oregon coast last Thursday. We had the opportunity to photograph thousands of nesting birds. The low tide offered us an opportunity to walk closer to the bird colonies, and gave an opportunity to see tide pools filled with marine life. The lower rocks were filled with Harbor Seals. One of the biggest parts of the class was learning to make order out of the pandemonium of the scene. The air is filled with the calls of the birds, the ocean waves are crashing on the rocky shoreline, and the constant movement of the birds. The area had over 60,000 nesting seabirds, raptors and songbirds. The species most prevalent were Common Murre, Brandt’s Cormorants, Pelagic Cormorants, Peregrine Falcon, Bald Eagle, White-crested Sparrow, Turkey Vultures, Gulls, and Great Blue Heron. 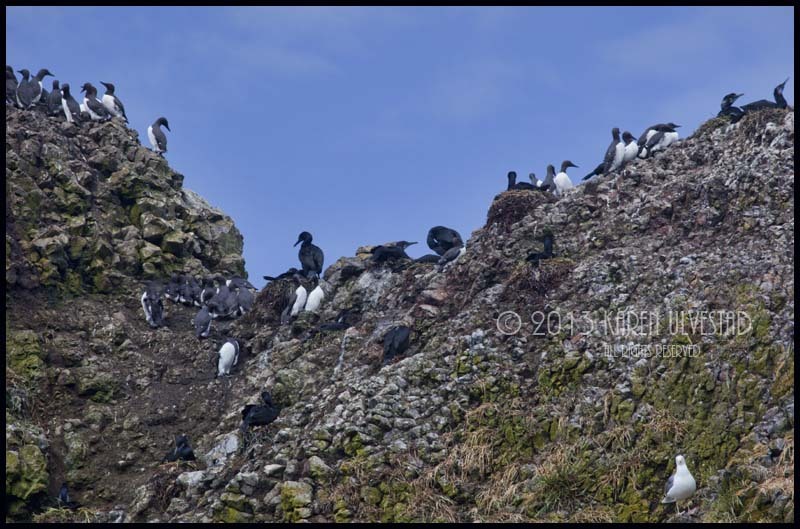 The photo above is a small section of the Common Murre colony. Often times, these areas are windy. It is advisable to use a lens with Image Stabilization (Vibration Reduction, etc. ), or a sturdy tripod, when photographing the birds. Video clips always require a stable tripod. The photograph below was taken from the beach looking up at the birds. These nesting areas usually have several species of birds nesting together, though each has a “zone” they will use. 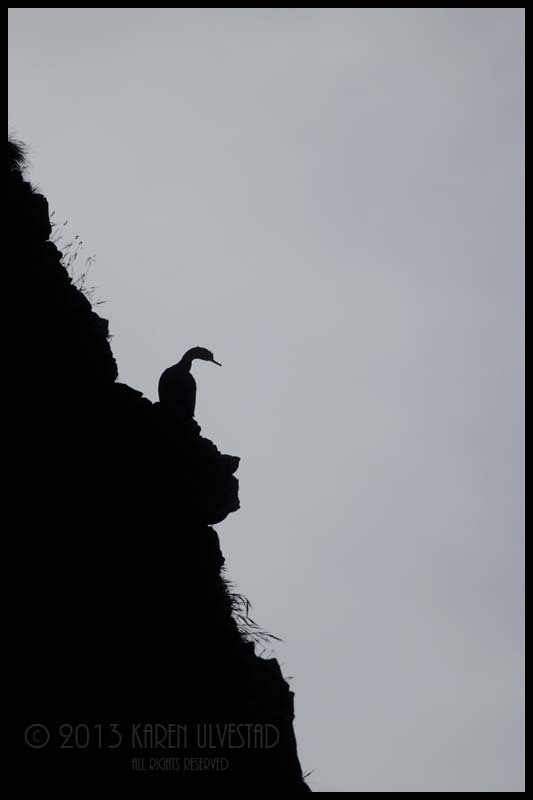 In this instance, the birds at the top are mostly Common Murre, while the Cormorants are intermingled or below. The lowest level in this image would be the Gulls. In addition to all the visual, audio, and physical input, it is important to remember to think about composition, exposure, and focus. The image below was visualized before being taken. The composition is relatively simple. The exposure allows the fore-ground to silhouette against the sky. These are the pieces that create the successful image within the arena of pandemonium of the scene. My next workshop on Bird & Wildlife photography will be July 27 & 28, 2013 through the Pacific Northwest Art School.